This is the classic cookbook, in its entirety—all 524 recipes. “Anyone can cook in the French manner anywhere,” wrote Mesdames Beck, Bertholle, and Child, “with the right instruction.” And here is the book that, for more than forty years, has been teaching Americans how. Mastering the Art of French Cooking is for both seasoned cooks and beginners who love good food and long to reproduce at home the savory delights of the classic cuisine, from the historic Gallic masterpieces to the seemingly artless perfection of a dish of spring-green peas. This beautiful book, with more than 100 instructive illustrations, is revolutionary in its approach because: • it leads the cook infallibly from the buying and handling of raw ingredients, through each essential step of a recipe, to the final creation of a delicate confection; • it breaks down the classic cuisine into a logical sequence of themes and variations rather than presenting an endless and diffuse catalogue of recipes; the focus is on key recipes that form the backbone of French cookery and lend themselves to an infinite number of elaborations—bound to increase anyone’s culinary repertoire; • it adapts classical techniques, wherever possible, to modern American conveniences; • it shows Americans how to buy products, from any supermarket in the United States, that reproduce the exact taste and texture of the French ingredients, for example, equivalent meat cuts, the right beans for a cassoulet, or the appropriate fish and seafood for a bouillabaisse; • it offers suggestions for just the right accompaniment to each dish, including proper wines. 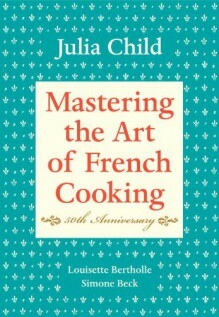 Since there has never been a book as instructive and as workable as Mastering the Art of French Cooking, the techniques learned here can be applied to recipes in all other French cookbooks, making them infinitely more usable. In compiling the secrets of famous cordons bleus, the authors have produced a magnificent volume that is sure to find the place of honor in every kitchen in America. Bon appétit!